U.S. Secretary of State Tillerson shakes hands with Ukrainian Foreign Minister Pavlo Klimkin at the State Department in Washington, March 7, 2017. Ukrainian Foreign Minister Pavlo Klimkin says U.S. Secretary of State Rex Tillerson has assured him that Washington will continue to support Kyiv in its standoff with Russia. Klimkin spoke to reporters after meeting at the State Department Tuesday with Tillerson, the former ExxonMobil CEO who now serves as President Donald Trump's top diplomat. Their meeting came amid ongoing concerns in Ukraine, and among its supporters in the West, that Trump could soften the U.S. line on Russia, given his stated desire to repair relations with Moscow. Trump's new administration, however, has so far publicly supported the continuation of sanctions imposed on Russia following its 2014 seizure of Ukraine's Crimean Peninsula, and its support for separatists in the country's east. FILE - A woman accompanies her child to be evacuated from Avdiivka to Sviatohirsk, a town about 140 kilometers (88 miles) away and far from the conflict front line, in eastern Ukraine, Feb. 5, 2017. Ukraine a 'key partner' of U.S.
"[Tillerson] assured me that the United States would consistently continue to support Ukraine in its struggle against Russian aggression, that Ukraine is a key partner of the U.S. in the region, that the U.S. would also consistently support Ukraine on its path of reforms," Klimkin said, adding that their talks included "a wide range of questions" about U.S.-Ukrainian cooperation. "We also discussed ... what we can do to change the situation when Russia does not fulfill the Minsk Agreements," Klimkin told VOA. "We have discussed a couple of options. We will continue discussing that, but today I want to stress specifically that the U.S. wants to stay engaged in this process. Some additional details will be known soon." 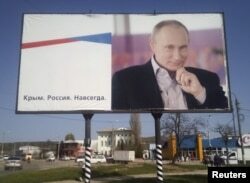 FILE - A billboard with a portrait of Russian President Vladimir Putin is displayed on a street in Kerch, Crimea, April 7, 2016. The board reads: "Crimea. Russia. Forever." Ukraine's Foreign Ministry said in a statement that Tillerson told Klimkin the U.S. sanctions against Russia would remain in place until "aggression is ceased," until the Minsk peace deal to end fighting between Kyiv's forces and Russia-backed separatists is implemented, and until Moscow returns to Kyiv control of Crimea and separatist-held areas of eastern Ukraine. State Department spokesman Mark Toner confirmed the main points of Ukraine's summary of the diplomats' discussions. "Secretary Tillerson reiterated the strong U.S. commitment to Ukraine and our commitment to ensuring that all sides fulfill their Minsk commitments," Toner told reporters at a briefing. "And that includes Russia." The spokesman added that the Klimkin-Tillerson discussions included "domestic issues within Ukraine" as well as the United States' "continued concern" about compliance with the Minsk peace deal. 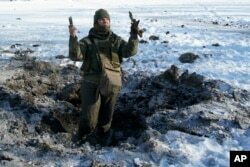 FILE - A Ukrainian soldier shows pieces of shrapnel in a crater left by an explosion in Avdiivka, Ukraine, Jan. 31, 2017. Russia rejects accusations by Kyiv, NATO, the EU and the United States that it is backing the separatists with weapons and personnel, despite substantial evidence of such support. More than 9,750 people have been killed in the war in eastern Ukraine since April 2014. More than 40 died during the first two months of this year, when hostilities in the conflict suddenly surged. Trump suggested during last year's U.S. election campaign that he would consider lifting sanctions imposed on Russia by his predecessor, Barack Obama. Since Trump's inauguration, however, Tillerson and other senior U.S. officials have publicly voiced a tough stance, saying that Russia must return Crimea to Ukraine and de-escalate violence in eastern Ukraine. Early Tuesday, Trump took to Twitter to criticize Obama for supposedly failing to resist a strong Russian leadership when Moscow's role in the Ukrainian conflict began. "For eight years Russia 'ran over' President Obama, got stronger and stronger, picked off Crimea and added missiles. Weak!" Trump tweeted, directing his note specifically at a Fox News program he is said to be fond of watching. 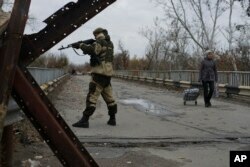 FILE - A Russia-backed rebel stands guard on a newly reconstructed bridge which connects rebel-controlled territory and government-controlled territory in Stanytsia Luhanska, eastern Ukraine, Oct. 27, 2015. Several hours after his meeting with Tillerson, Klimkin told a Senate Appropriations Committee hearing that the secretary of state gave him a strong signal that Ukraine would not become a bargaining chip in any push for rapprochement between Moscow and Washington. It was a "very strong message of support for Ukraine, and that any kind of tradeoffs are not possible," the Ukrainian visitor told senators, adding that his president, Petro Poroshenko, has received similar assurances in conversations with Trump. Before his testimony, Klimkin told VOA that Ukraine's position is that "Russia should not be trusted, and that Russia has violated all fundamental principles of international law and political commitment." Myroslava Gongadze of VOA's Ukrainian Service contributed reporting for this story.